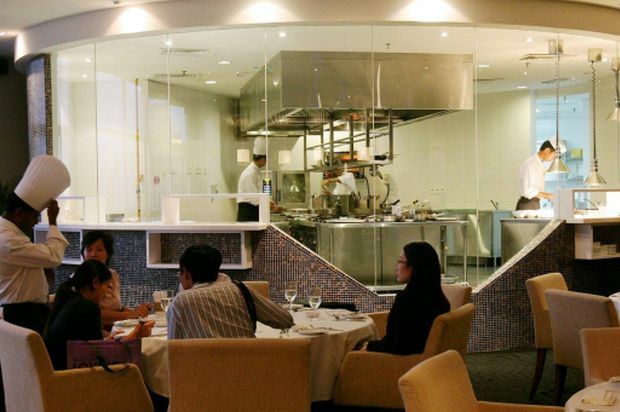 WITH a scenic view of the Kuala Lumpur skyline and a stylish interior, Berjaya Times Square Hotel’s Samplings on The Fourteenth restaurant makes for a classy alternative to celebrate St Patrick’s Day if you want to avoid the boisterous bars. Chef Valmurugan Subramaniam, 43, had created a special set menu (priced at RM140++) for the occasion, starting with the Oyster Kilpatrick served with spinach and crispy beef bites. “There are three pieces of oyster but it won’t be too heavy because the four courses in the menu are quite light and not too rich,” he said. Even though the oyster dish looked fairly simple, Valmurugan said the beef bites were baked in the oven for an hour. “Instead of deep-frying to get the crunch, it’s lightly pan-fried with olive oil and baked at a low heat until crispy,” he said. The oysters were followed by a course of Clear Chicken Essence served with a goose liver ravioli and pearl vegetables. 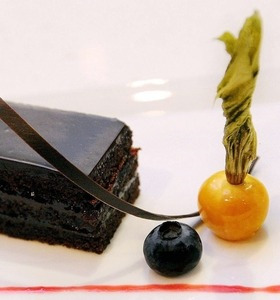 Refreshing: The Raspberry Chocolate Cake had layers of a tangy raspberry sauce and served with a fresh winter berry. Valmurugan said the soup was made with a combination of vegetables marinated in egg white boiled in chicken stock over low heat for four to five hours before the solids are strained out, leaving the clear liquid. For the main course, there was a choice of either the Red Emperor (pan roasted snapper fillet on fennel served with saffron and a baby vegetables broth) or the Grilled Australian Beef Tenderloin (topped with a Merlot and bone marrow jus). “Instead of the usual cream sauce, I decided to go for a lighter broth for the fish. The star of the beef tenderloin is the bone marrow jus, which can be ordered without the red wine added to it,” said Valmurugan. The tenderloin was served with a bed roasted vegetables and finger potatoes. The dinner was nicely wrapped up with a platter of Raspberry Chocolate Cake served with fresh winter berry, accompanied by a choice of coffee or tea.